As far as organizing tips are concerned, these are hardly the most revolutionary. However, implementing simple tricks and devices like these you can ultimately save yourself time, effort, and frustration over the longterm. Use transparent Window Clings to attach parking pass stickers to your car windows. This will save you time from having to later scrape them off. If your jurisdiction requires permanent car licence or registration stickers, please abide by those requirements. Colourful Window Clings can be used to stick to the bathroom mirror to remind children to wash their hands or brush their teeth. Schools, daycares, and camps often require that children’s clothing be labeled with their names. Rather than order pre-printed, iron-on labels and wait for them to arrive by post, make your own with iron-on tags from Avery. You can even add a small picture beside the name for children just learning to read. They also pull-off nicely when it’s time to donate your child’s clothing to charity or to use as a rag. Anyone to whom you regularly send correspondence: parents, children, bill payments. When you print them at home, you also determine what information you wish to provide on the label. Besides your address, you may want to have your name and email address only or name and cell phone number. If you buy an item that has a warranty, staple the purchase receipt inside the front cover of the instruction booklet. If you need to return the item, you will be able to find the original receipt. Also, write the model and serial number of your item on the inside of the cover of the instruction book. Store your instruction/warranty booklets in your filing cabinet or a filing box or a magazine file. If your items are ever stolen or damaged (fire, flood), you will have proof of ownership for your insurance company if you also take a scan of this information or a digital image with your smart phone and have an online backup. If your doctor sends you for tests at a private clinic, always get a business card from the clinic. On the back of the business card write the type of exam that you had and the date of the exam. Keep the business card in your Health file in your filing cabinet. You will always be able to request the necessary information if another doctor asks for it. You can do the same with other businesses and service providers, as well. Purchase a package of small removable stickers and clip them to your fridge. Whenever you put leftovers in the fridge, write the date on a sticker and stick it onto the container of leftovers. This way, everyone in the family will know how long the container has been in the fridge and when it should be thrown out. Check out Still Tasty to learn about the best way to store leftovers and how long they should be kept. Are there any simple tips and tricks you’ve developed to save time, effort, and frustration? Share them with Unclutterer readers in the comments. It’s summer! (Well, at least it is for those of us in the northern hemisphere.) It’s grilling season! It is also apparently time to buy stuff to use on your grill that you don’t need! Reader Rachel wants to know how to implement GTD without paper files. Tipping tacos are a tragedy. A contemptible calamity. An ignominious injustice. A monstrous misfortune. Creative personalities have the stereotype of being messy, disorganized people. When, in reality, the incredibly successful creative people of the world are often profoundly organized — they have to be to manage their work and schedules, so they can be ready when inspiration strikes. The art directors at Pixar know just how uncomfortable cable clutter can be. For many of us, summer means travel. Those with a smartphone have a real advantage when it comes to keeping your travel plans organized. There are apps available for smartphones that include a tour guide, language translator, travel service, camera, and so much more in your pocket. Additionally, one way to receive wonderful travel tips and advice, information and inspiration is from helpful Twitter accounts. By installing a Twitter app on your phone, you can have a wealth of information available, no matter where you are. Summer storms can disrupt your travel, and spending the night on the floor of an airport is no fun. A great way to stay on top of the latest alerts, changes, and notices from the major airlines is to subscribe to their Twitter accounts. Choose a Twitter app for your smartphone that supports notifications (I use Twitterrific, but there are many others available). A day before you travel, enable notifications for mentions. That way, if you send a message to your airline’s account, your phone will let you know when you’ve received a reply. Nomadicchick: Jeannie Mark is a travel writer and the blogger behind NomadChick.com. Her Twitter account is full of beautiful photos and videos, as well as links to her insightful articles. You an search her Twitter stream and her site for information on your destination. Adventurevida. This account is for the adventurer traveler. You’ll also see tweets on gear and, of course, beautiful photos. Heather_Poole. Heather Poole is a former flight attended and author of The New York Times bestseller, Cruising Attitude: Tales of Crashpads, Crew Drama and Crazy Passengers. Follow her Twitter account for, among other things, hilarious stories from the flight deck. GaryLeff. For those of you who are serious air travelers and who are always on the lookout for the best point deals, Gary Leff’s Twitter account and his travel column ViewFromTheWing are an enormous resource of information. TravelEditor. The official Twitter account of The Independent Traveler routinely shares great travel tips. Budgettravel. Budget Travel offers super tips for getting where you need to go without spending a lot of money. You’ll also see area-specific deals and destination suggestions like these five classic American drives. 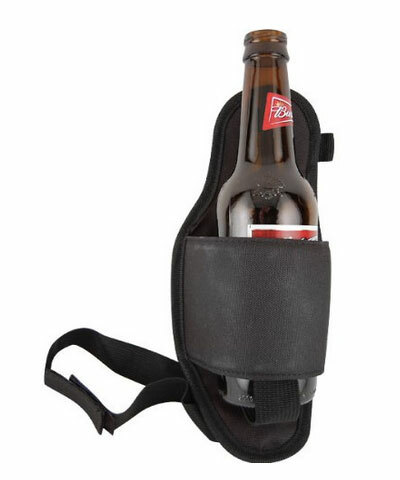 Thanks to Unclutterer Dave for finding the Beer Holster unitasker for us. Are you holding on to stuff that you don’t use or want? Follow these three steps to let go of them. Some weeks, I need to write a great amount of exposition about our featured unitasker because some folks might not be aware of how a product lacks utility. This is not one of those weeks. Wow, I wonder how many of these Meatball Grill Baskets Williams-Sonoma is going to sell? I spent two years as the secretary of an organization whose board met monthly, and during that time I thought a lot about agendas and minutes. Based on this experience, the following are suggestions for creating agendas and minutes that are organized and both easy to write and easy for others to read and use. With an agenda, your meetings will be shorter and have a defined purpose for all the attendees. Use a template where you can just fill in the spaces. I used Microsoft Word with a series of tables and there are also Microsoft designed ones you can customize. There are many advantages of using a template, saving time and remembering recurring agenda points among them. Logistics: This section often includes the meeting location along with the meeting date and time. Because WiFi access was an issue for my group, which used hotel meeting rooms, I always noted if WiFi would be available in the room. If WiFi was available, I’d also list the price. Attendees: This is a simple list of people expected to be in the meeting, and their titles. Meeting preparation: If meeting participants are expected to do anything before the meeting, these items can be noted in this section. In our case, there were always documents that needed to be reviewed before the meeting. Agenda items: These are the points to be discussed or have action taken upon them at the meeting. Each of these items should have the name of the person leading that part of the discussion and the anticipated start time for that part of the agenda. Noting the time allotted to each item was critical to our group for ensuring we stayed on schedule. In the meeting, we sometimes chose to run overtime on one item, but we realized that meant something else would need to run shorter, or be cut entirely. Open to-do items from the prior meeting: Review of these items should be an agenda item if you have any previous or unfinished business. Email the agenda to people a number of days before the meeting, so everyone has time to prepare. Include attachments along with the agenda for items that will be distributed so that members don’t waste time reading the materials during the meeting. All items from the agenda, with updates: The attendee list notes who actually made it to the meeting. The agenda is adjusted to show the actual time each item started. Also, update the to-do item status (more on to-do items below). Decisions that involve formal motions and votes: This includes motions and the number of people voting yes and no (as well as how many abstain). Not all decisions require an official motion and a vote, but record those that do. Other decisions: This section notes anything that is decided that doesn’t need to be put forth for an official vote. I often just captured the decision itself; in some cases, it was useful to also capture the reasoning behind the decision. To-do items from the current meeting: This includes the item, the owner, and the due date. To-do items without an owner and a due date tend to not get done, so be sure to clarify these points during the meeting. Critical information that is shared: Relating to our group, as our annual conference was being planned, I might have noted the venue, the date, the keynote speaker, the price, and the registration period as each of these points were finalized and reported by the head of the conference committee. If something was important enough that our members would want to know about it, I captured it in this section. When we had young children, it was important for us to have a large calendar on the wall so that everyone could see and prepare for upcoming engagements. It was a good teaching tool for the kids. They learned the days of the week and they learned to count down days until a big event. We had the calendar posted on the wall in our dining room. This allowed us to see the upcoming day during breakfast, and at dinner we would discuss upcoming events plan for the following days. We used Command picture strips to mount the calendar on the wall. We also had a decorative wall-hanging the same size as the calendar. Whenever we had adult guests for dinner, the calendar came down and the decorative wall hanging went up. We used a 60-day perpetual calendar. Everyone could see two months. When one month was done, we could add the next month so we would not miss things as one month rolled over to the next. It also allowed us to do longer-term planning. Before the children could read, I used the computer to print various clip-art drawings for things like dentist and doctor appointments and holidays. I printed the clip-art drawings on removable stickers. We assigned each person in the family a different colour for his or her events. We decided that because our last name is Brown, we would use a brown marker for events involving the whole family. Using the computer, we printed each person’s repeating events on removable coloured stickers in their assigned colours to save time writing each event over and over. 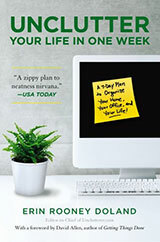 I included many things on my calendar that fellow Unclutterer, Jeri Dansky, suggests including community events, school events, and when to water and fertilize the houseplants. I also write garbage and recycle collection days on my calendar as well as household hazardous waste and electronics collection events. As the children grew older, they were encouraged to write their events on the calendar themselves. They learned about budgeting time as well as coordinating with other family members. I used a paper-based purse-sized planner that mirrored the wall calendar. On Sunday evenings, I would ensure that I had transferred the upcoming weeks events from my planner to the family wall calendar and visa versa. I used the printed removable stickers to quickly and easily put repeating events in my paper planner. There are several benefits of using an online calendar. Repeating events are easy to add. Any family member can add events to the calendar of other family members anywhere at any time. For example, if one of the children has an appointment and I am not able to take the child, I can add the appointment to my husband’s calendar so he knows he will be busy at that time. Additional information can be added to an event. If you have a meeting scheduled, you can add the contact information of the person you’re supposed to meet, the address of the meeting venue and a list of documents required for the meeting. Events can have alerts and alarms to remind people where they need to be and when. This is important for teenagers whose eyes never seem to leave their phones. 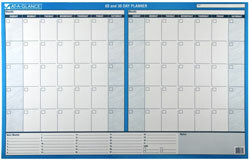 Using a calendar to which the whole family has access is important in keeping everyone organized and on track. It doesn’t matter if it is a paper-based or electronic system, simply choose what works best for your family. A special cloth to push glitter around! Gee wiz! Thanks, Martha! My friend uses an onion on the end of a barbecue fork to clean the grate of his barbecue grill. I use a metal grill brush. Neither of us turn to the Grillion to melt plastic onto our grills while we clean. As someone who simply put a thick towel in the bottom of the sink when she bathed her infant, I can only smile and laugh when I look at the Tummy Tub Baby Bath. We’ve often talked on the site about donating things you’ve uncluttered, but what about supporting charities in other ways? The following is an organized approach to making other donations, if you feel so inclined. Include charitable giving in any financial budgeting process you have. If you want to donate your time, make sure that time commitment fits into your time “budget,” too. I’ve selected a few charities I give to every year, and I sometimes support friends I know doing a charitable walk, run, climb, or bike ride. Having made this decision, I don’t waste time evaluating all the solicitations that come my way in the mail; they go straight into shredding and recycling. They may be for good causes, but I can’t personally support them all. The percent of charity expenses that go to administrative and fundraising costs — commonly referred to as “overhead” — is a poor measure of a charity’s performance. You may want to spread your donations out over the year, or you may prefer to sit down once a year to do all your donations. You might also want to consider making ongoing automatic monthly donations. Charities love these because they have a revenue stream they can count on — and probably because people seldom change or cancel these donations. If you go this route, make sure you know how to adjust your donation, and don’t hesitate to do so if your financial situation or your donation priorities change. I have one such donation, and I recently called and reduced the amount; it wasn’t difficult at all. If you itemize deductions on your U.S. individual tax return, you can deduct qualified donations. If you do this, make sure you have proper records of your giving. Those records can include cancelled checks, credit card statements, and acknowledgement letters from the organizations that received your donations. If you give small donations at the along with your purchases from grocery stores or places like PetSmart, be sure to keep those receipts, too. A simple manila file folder, envelope, or even a gallon-size zip-top bag labeled with the calendar year on it can suffice for keeping all your receipts in one location. Also remember that you can deduct “any unreimbursed out-of-pocket expenses, such as the cost of gas and oil, directly related to the use of your car in giving services to a charitable organization.” If you’re donating your time and this involves the use of your car, you’ll want to keep the appropriate records to claim that deduction. My wife and I live in a rural home on a dirt road with no street lights. Most of our neighbors are “summer people,” meaning their houses are empty for eight or nine months out of the year. All this to say that, when the sun goes down, it gets dark. This can make it difficult to, among other things, find the bathroom at night. Fortunately, Jonny Glow is prepared to light the way! 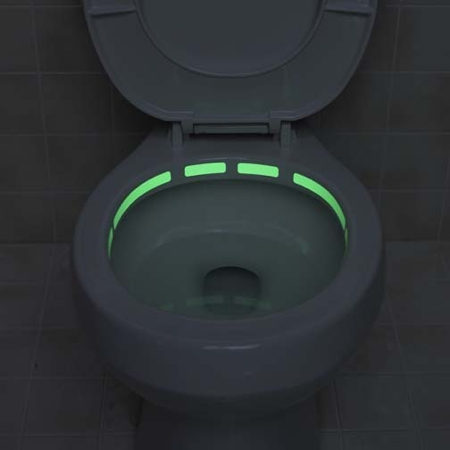 Meant to “help you see where you are going,” Jonny Glow adheres to the inside of the bowl and is powerful enough to “glow all night.” You can buy one or even a five-pack if you’ve got a large home with several bathrooms. Sure, you could simply install a nightlight or just turn on a light, but whatever. Plus, I bet it really freaks out the cat. Of course, if you’re the DIY type you easily make your own! Buy a roll of glowing tape, as is often used in theaters, and save a few bucks. Plus, 30 feet of tape should let you do just about every toilet, kitty litter box, doggie door in the house. 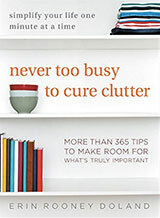 Guest post author and professional organizer Janine Adams gives seasoned, practical advice for keeping your craft and/or hobby supplies from taking over your home. When did knives become too difficult to use? When did crust become something you don’t eat? When did we become a people demanding the production of the Krustbuster? Two weeks ago, I started an exploration of lesser-know filing systems with the Noguchi system. This method, devised by Japanese economist Noguchi Yukio, utilizes manilla envelopes and the frequency with which you work on certain projects to organize your projects. Today, I want to delve into a system close to my heart, a system that uses index cards. Hawk Sugano (you’ll find him on Flickr as “hawkexpress”) has devised a system he calls Pile of Index Cards (PoIC). It’s a combination of a “brain dump” (emptying one’s mind of all important information by writing it down), long-term storage for reference, and David Allen’s GTD method. It’s all managed by a “dock” of 3×5 index cards, and the result is tidy and searchable. The following are instructions for how to set up and use the system. The list is a short one. Get some index cards, which you can find almost anywhere (or grab some fancy ones here), a favorite pen, and a storage box with customizable tabs. That is all you need to be ready to use the method. The Record Card. He describes it as “a diary, note, account, health, weather, cook, any kind of records about us belongs to this class.” I’d say this is the incoming “stuff” of the day: appointments, notes to follow up on, etc. The Discover Card. Hawk describes the Discover Card as “Things from my brain, mind, spirit, anything emerge from inside me, are classified into this class.” This is the result of a mind dump. Don’t worry about classifying when filling out a Discover Card. Just get whatever is on your mind out and onto paper. The GTD Card. Here he combines the title of a project and several actions that pertain to it (here’s a look at the template in English). This reminds me of the “Hipstper PDA Template” I used religiously about 10 years ago. Each card is stored in a box, or “dock.” Note that Hawk makes a mark on the top of each card. It’s position indicates the type of card, so you can easily identify each one while it’s in the dock. Finally, he uses the tabs to keep the types of cards sorted. I’ll admit that this method is a bit labor-intensive. For example, Hawk does not throw any cards away. Instead, he buys another dock. One person took steps to improve upon this by adding what he calls the “43 Tabs” system. Basically, older cards that are no longer pertinent are moved to the back of the dock, while those still in action are moved to the front.